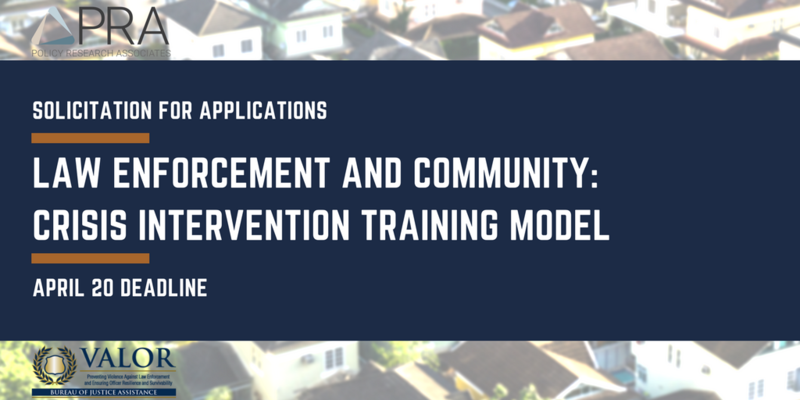 Applications are now being accepted for the Law Enforcement & Community: Crisis Intervention Training (CIT) Model Program, supported by the Bureau of Justice Assistance VALOR Initiative. U.S. law enforcement agencies are encouraged to apply by April 20! U.S. law enforcement agencies are invited to apply to participate in the Crisis Intervention Training Model project, which is a part of a larger program within the Bureau of Justice Assistance’s (BJA) Preventing Violence Against Law Enforcement Officers and Ensuring Officer Resilience and Survivability (VALOR) Initiative. This project is managed through Policy Research Associates (PRA) with its partners: the International Association of Chiefs of Police (IACP), CIT International (CITI), and the National Alliance on Mental Illness (NAMI). A total of four (4) agencies will be selected and will work directly with PRA and its partners to strategically implement a comprehensive and sustainable CIT strategy for their agency from June 2018 to May 2019. Through this program, agencies will improve their response to and interactions with persons with mental illness. We thank you in advance for your interest and look forward to reviewing your application. We may be interested in applying for this. However, we are still trying to figure out what you will be providing. Will this include money for FTEs to run and implement this program? What all does this include? Is there a page to go to that explains all that is involved? Hi Tony, thank you for your interest! There is no money involved. TA is provided to create an implementation strategy and throughout the implementation period (June 2018-May 2019). We will also provide the 40 hour CIT training and TTT for attendees. Lastly we will evaluate agency implementation and provide feedback. Looking forward to seeing your application! My agency is reviewing the information regarding this conference. We are a mixture of Corrections Officers, Corrections Healthcare, Corrections Mental Health, Department of Human and Health Services, and the Governor’s Office. Are these the type of professions expected to attend this conference? I appears the conference is Free, but I cannot seem to find what dates it is scheduled for or the location. My apologies, my last question appears to have not went through. I was asking if there is an Agenda for the conference? Is there a minimum size requirement in terms of number of officers before an application can be made? If so what would that number be? This sounds like a program that is mostly for larger agencies. Do you have a recommended sized community and/or sized agency that you feel will likely meet your program’s needs? Hi Buddy, we recommend reviewing the FAQ document: https://www.prainc.com/wp-content/uploads/2018/03/Solicitation-FAQ.pdf.